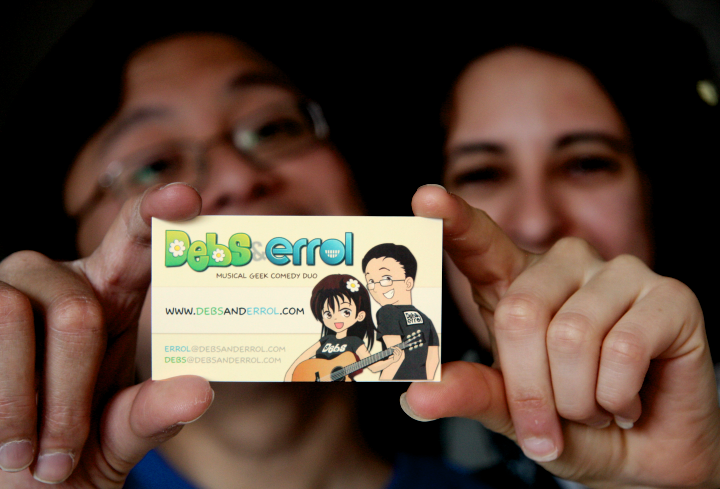 Debs: Errol picked up our business cards today – just in time for our show this weekend! He designed them while I looked over his virtual shoulder and insisted that he try my 5000 suggestions. I bet that’s the last time you work on stuff in the shared dropbox, right Errol? YOU’RE WATCHING ME DO THIS? Debs: Look how cool they look! He was going to order 100 but I insisted on 250. Why? We can drop them into fishbowls at restaurants and win free food! In other news, I just finished the first song I’ve written since February! It was inspired by something devastating I learned about Errol…something so awful that I could only express it through music. We’ll be performing it at this Sunday’s show and it will also go on our upcoming CD.